Copy these flames fire drawings to prove to yourself that you are capable of drawing anything you put your mind to. When you teach yourself to draw, you have to make yourself try different subjects just as though a teacher was standing beside you, telling you what to do. Nothing happens if you haven't got the dedication to learn - I think that goes without saying. Sure, the resulting image might not be very successful but the next one will be better and from there it just improves each time. At this stage, I avoided drawing sticks or tinder because of the level of difficulty and instead I chose to have a circle of rocks. When I created these images, my drawing experience was only into its sixth month so I carefully stayed within my capabilities, to protect myself from suffering too much disappointment. 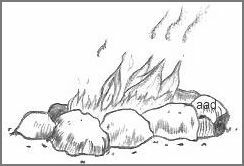 Here is an outline of a campfire that is designed to simplify a normally complex subject. Flame drawing would best be done in color but for the exercise of achieving a good resemblance, it does us good to practice in pencil first. 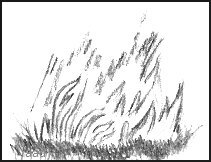 When you learn how fires are built (see below), you also learn how to draw them in a way that tells a story. According to the dictionary, fire is flame, heat and light caused by something burning. Substances burn in different ways. Charcoal has a faint glow and heat is emitted. Coal, gas, oil and wood have heat plus a flame. The color of the flame depends on the type of substance burning. Did you know, if rags soaked in oil or paint are thrown into a pile in a shed, oxygen from the air slowly unites with the oil in the rags and enough heat is accumulated to set the rags alight. That uniting process is called oxidation. We know it as 'spontaneous combustion' and lots of fires happen this way. That's pretty scary, hey? Before a regular fire can be made, there must be fuel or a material that will burn. Then that fuel must be heated to a kindling temperature, and, there must be plenty of oxygen. Oxygen supply is usually taken from the air because air is about one-fifth oxygen. Cavemen discovered a way to start fires with friction. They whirled a stick in an indentation in another piece of wood or rock until a glow was produced. They gently blew on the glow to give a supply of oxygen which in turn produced a flame. It is possible to start a fire in this manner but we are pretty spoilt and have handy tools at our disposal now. Matches were invented in 1827. When the match tip was struck on a rough surface, the friction produced enough heat to ignite the match. Ok, this is a drawing site so why am I telling you how to start a fire? Well, I think it's fitting that you know everything if you want to illustrate them properly! 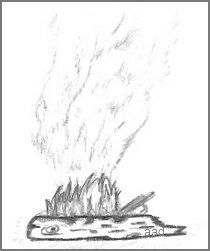 This information helps you format your flames fire drawings in a way that shows you are knowledgeable about your choice of topic. To get a campfire going, you need tinder and kindling, then a heavier wood to keep it going. Tinder would be dry grass, dead leaves, bark and tiny twigs. Kindling is thin sticks about pencil thickness. Put the tinder down first, then lay the kindling on top, going from the thinnest to the thickest pieces on top. Keep it in a loose pile so that air can circulate. Light a match and set it to the tinder close to the ground. The tinder will flare up and once the kindling starts to burn well, gradually put larger sticks on top until you have the size of flames you want. The only way to become good at flames fire drawings is by repeatedly practicing them. Fill a whole page and have the attitude that you don't care how they turn out -- the results will likely surprise you. Flame art looks spectacular and makes an interesting talking piece if you hang your creation on the wall. Your home is your private art gallery so make the most of it. To add coloring to your flames fire drawings, use oranges, reds and yellows and that will give good contrast to the flames. Enjoy!